The Nature Reserve, arguably Greyton’s greatest asset, was established by Professor Brian Rycroft on 13 May 1977. At the time he was Director of Kirstenbosch Botanical Gardens. The reserve is approximately 2200 hectares in extent and is the third largest Nature Reserve in the Cape. It has never been properly explored and according to Professor Rycroft, contains plants that have not been seen since they were described by Burchell in 1812. On 5 January 1979 the village and its friends turned out in strength to celebrate the proclamation of the new reserve. Dr Douglas Hey, Director of Nature Conservation in the Cape, officially opened the reserve and spoke to an audience of some 200 people about problems facing conservationists. The reserve was proclaimed under Ordinance 19 of 1977 and is officially known as Greyton Natuurpark. It is subject to the regulations promulgated for nature reserves in Provincial Note PN 955/1975, amongst which it is stated that no domestic animals, including dogs, are allowed in the reserve and no swimming is permitted in the streams or dams. Subsequently the appointment of an Advisory Board was effected through Bye-Law PN 235/1978. The Board consists of six members, three appointed by the Theewaterskloof Municipality and three by the Cape Nature. The Board’s mandate is to monitor the reserve and to make recommendations to the Municipality in connectio with the management, control and development of the reserve. In this regard a management plan was drawn up in 2000 and reviewed in 2012. The reserve lies on the steep southern slopes of the Riviersonderend Mountains forming part of the Cape Folded Belt. Ragged peaks and deep ravines are present. Soils derived from weathering sandstones and quartzites are generally shallow, sandy, acid and low in nutrients. The upper boundary, in approximate terms, extends from Uitkykkop to Wa-en-Osse then with a dogleg across to Perdekop and follows farm boundaries down to the Riviersonderend road. On the lower boundary the reserve can be entered via the gate at the north end of Park Street or from the east bank of the Gobos River on the Maermanskloof Trail. The annual rainfall varies between 600mm and 900mm and occasional winter snow appears at altitudes of 850m. The rainy season usually lasts from April to October while air temperature ranges from just below freezing to about 40 degrees centigrade. The Gobos River (originally Ghoebos, meaning wild almond) and its tributary from the Noupoort lead their perennial waters to the Riviersonderend which flows further south through the Greyton Commonage. The vegetation is classified as fynbos with a large variety of plant species. 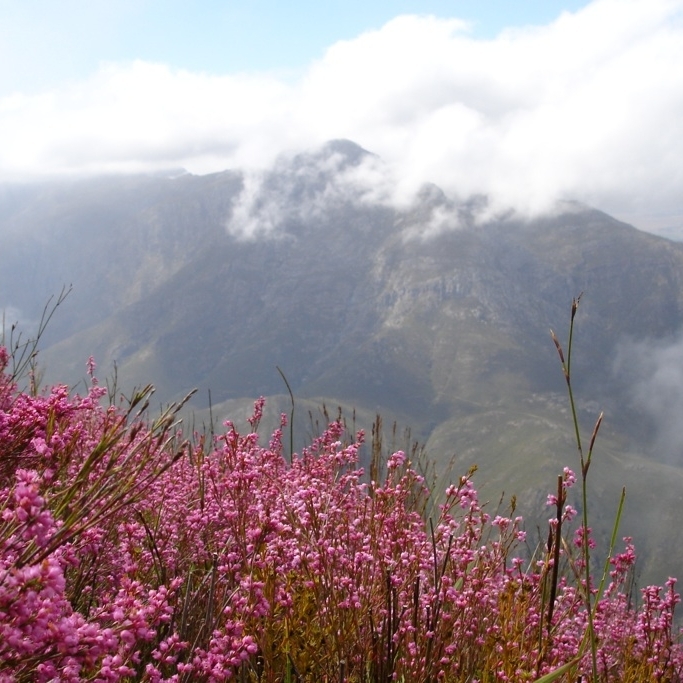 The fynbos is particularly associated with sandstone and poor white, sandy soil in regions receiving a winter rainfall of at least 250mm per year. Carpets of flowers do not occur in this area but in March and April large patches of the mountain become covered with a colourful display of Erica tennuifolia and Erica equisitifolia. A wide variety of other flowers abound throughout the year, especially after a burn – a veritable botanists’ paradise.